What's New at Groovynet - Birthday 2006 Edition! If you find this useful, please forward it to a friend! Click! Happy Birthday to Groovynet! It's our 8th birthday and we're so happy to share it with you, our visitors! We've had so many changes over the years and our subscribers are the first to find out "What's New"! We SINCERELY Thank you for your loyalty and support, and stay tuned, we'll be adding tons more great free content and stuff for you! 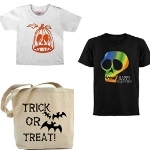 Trick or Treat Bags Halloween Tees! View all our Groovy Tees & More! That's right! We've given our Games a NEW HOME! Please visit Groovynetgames.com and play FREE Java, Flash and Shockwave Games! Over 300 NEW Flash Games, 60+ JAVA Games and 40+ Shockwave games all under one domain! We bring our games to you for FREE, No Memberships, Incentives, Logins or QUARTERS required! Play as many as you'd like and stay for as long as you wish, the door to our arcade is always open and ready for you! We've reworked our FREE Midi Madness section to make it even easier for you to download our Awesome Classic ROCK Music files! Use them as *RINGTONES*, on your website or just download them to listen to over and over again on your home computer or laptop! Over 500 Great MIDI Music Files brought to you for FREE! A Lot of Groovy Cards! Groovy Card of the Day! - Send a different card every day to your friends and loved ones! 60+ Really Groovy Fantasy and Anime images with hundreds of MIDI selections, Custom fonts and Background colors to choose from! These are Cool! Fractal Groovycards! Psychedelic High Color fractal images! Send these with a cool music selection for any occasion! Really Groovy! Visit our GroovyCards Home Page and make your selection from thousands of Ecards ready to send! ..:: Groovynet (Finally) has a MYSPACE! ::..
Do you have a Myspace? We do too! Add Groovynet to your friends list and keep up with the newest happenings! Do you have a website? Do you have a Myspace or Xanga blog? Do you want to make some extra cash? Groovygreets - Ready to send Greetings, Send these to up to 20 friends with one click! Inspirations! - 16 NEW Ready to Send Inspirational Greetings with fantastic photographs. Neato - 19 NEW Greetings to Amaze your friends! Trick Photography greetings and Optical Illusions! Humor! - 19 NEW Ready to Send Greetings Featuring Clean Humor, Nostalgia and More. These are fantastic and Always Appropriate!! Monthly Calendar Wallpaper! Our Calendar Wallpaper is Ready for pickup! Visit us each month to dress up your desktop with one of our groovy original art Calendar Wallpapers or just grab something groovy whenever you want! It's all free. As Always, We Thank You for Visiting Groovynet.com! We appreciate your kind thoughts and comments! Please Visit us again soon! http://www.groovynet.com - Art Is Power. Groovynet.com - Where it's at! Groovy Cards, Hot Java Games, Groovy Gear (Wearable Art! ), Free Music, Great Stuff for Kids, Grown ups and everyone in between. Check it out! GroovyGreets.com - Check out Our Great Java Enhanced Groovygreets with Real Audio! Up to 10 Recipients! Send a FREE Groovygreet to someone Special Today. Art Is Power - Free 3D Wallpaper! Really Groovy! Groovynet's Wearable Art! - Groovynet's Art on T-Shirts, Mugs and Mousepads. Free MIDI Madness! - Sing along with all Your favorite songs from the 60's, 70's, 80's and 90's at groovynet! . Make your selection from over 300 Classic Rock Midis! From New Wave to Classic 70's, We probably have it or can get it! Awesome Kids Start Page - Entertain the Kids for Hours! Nothing Boring Here! Visit Groovynet's Awesome Kids Start Page! With Party and Traveling Games, Activities, Crafts and Links to THE BEST Kids Sites around! Groovycards Entry Page - Tons of Categories to Select From! 300 + Midis and TONS OF GROOVY Art! Groovy Java Arcade Games - Groovynet's Free Arcade Games! Come play Asteroids (Just like you remember! ), Dig Dug, Tailgunner, Connect4, and many others! Can you beat the current high scores? Play as many (and as often) as you'd like! They're always FREE! Subscribe to our Mailing List Here - If you haven't already, Please sign up for our mailing list while you're here! Be the first on your block to see our latest Art, Cards and Additions!